Most fire deaths aren’t caused by fire, but by smoke inhalation. Smoke can overcome victims very quickly, leading to incapacitation and the inability to exit a building. Since the introduction of the Regulatory Reform (Fire Safety) Order 2005, the responsibility of fire prevention has fallen to a “responsible person” within the building, meaning it is up to that person to ensure life-saving, fire prevention assets such as fire doors are properly maintained and able to perform should a fire break out. With smoke being such a dangerous part of any fire, Stemko wanted to focus on some fire door checks you can make, so that if a fire does break out, you can be sure your fire doors will perform. NB: This advice is simplified and for guidance only. We recommend that someone competent is engaged to inspect the fire door, such as a registered FDIS Inspector. If smoke seals are installed, it’s important to make sure that they are closing the gaps in the door ensuring there is no gap from the end of the smoke seal to the door frame. Smoke will squeeze through any gap, no matter how small. Ensuring there are little or no gaps in intumescent and smoke seal protection is important. The smallest defect or missing piece can cause a fire door failure. 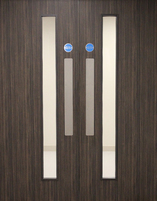 Fire doors are often used on a daily basis with people passing through them regularly. Incessant traffic can lead to fire doors deteriorating faster, so it’s important to check the most active doors more regularly. A door may have dropped, or become warped from being held open for long periods, resulting in the door not closing properly, this is especially prevalent with double doors. If the door doesn’t close properly, it won’t perform in the event of a fire, so if you notice this on one of your doors, it’s important to rectify it immediately.